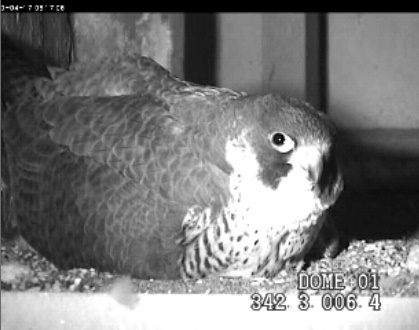 ~Peregrine Place~: ~Four eggs at Central Terminal! This shot taken Mar 24, 2010 when a third pefa was flying too close. Incubation may have already started by this time. Nestbox to the left of clock was installed by the DEC with the permission of the Central Terminal Restoration Corporation to give this territorial pair a safe place to rear their young. 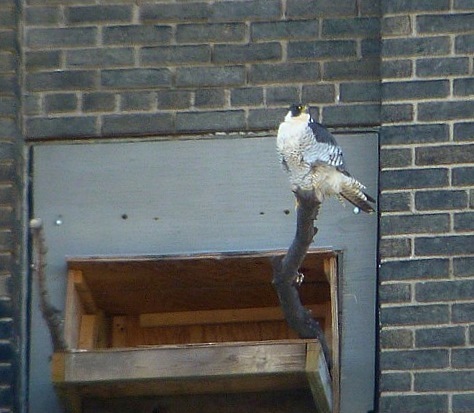 Last spring Stash and Stella claimed the tower and were seen mating though she was a sub-adult at the time. It was determined through frequent observation that this pair would have nested in this spot this year. This side is protected from the fierce winds which blow across the high point where the terminal is located. No eggs or evidence of breeding was found though. At this time of year I wish I had many more monitors to watch falconcams. I stayed over in Buffalo and checked out the Grain Elevators (GE), Central Terminal (CT) and UB. I ran into someone from the DEC checking on CT and she told me 4 eggs. I thought I was going to surprise you. Boy the DEC is going to have their hands full at banding time this year!! I'll post more on the Buffalo thread at rfalconcam.com later.